The following is a guest post from Crystal Marketing, a digital marketing agency with offices in Singapore and the Netherlands. An earlier version was originally published on LinkedIn. It has been adapted and expanded for publication here with permission from, and in collaboration with, Crystal Marketing. But while marketing teams rejoice when they generate a huge volume of enquiries from prospective students, sales and enrolment officers tend to take a different view. One of our clients, a government organisation in the education field, shared with us that they once ran a successful campaign on Facebook. The effort generated so many enquiries that they didn’t know what to do. They didn’t have the resources to personally contact all these people. The sad end result: the campaign was halted. It literally died of its own success. There is a general assumption that when campaigns or websites generate large numbers of enquiries, they can only do so at the expense of quality. If it’s too easy to leave an e-mail address or phone number, the people doing so are deemed “not serious enough” for in-person follow up. To avoid upsetting the sales team and wasting valuable staff time, many educational websites seem to make it purposely hard to register interest. The percentage of people filling out a web form decreases very quickly as the number of questions asked goes up, yet many institutions will ask anyone very specific questions on the courses they’re interested in; questions they may not even know the answer to. 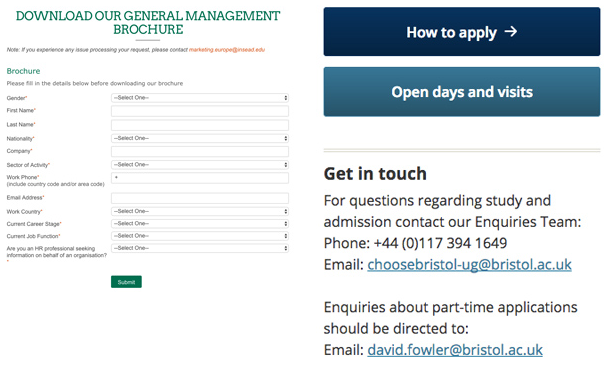 An example of a more complex enquiry form on the left, and a simple opt-in request on the right. Sure, the 25% prospective students who make it to the end of the form are going to be highly interested. That saves staff from having to follow up with the 75% of people who are not ready yet. The long form has scared off the other 75% from expressing their genuine interest in learning more about what you have to offer. Just because someone leaves an e-mail address to “stay updated about this course” doesn’t mean they’re going to apply tomorrow, or even this year. And having a large list of people who are interested in your institution and wanting to learn more is very valuable. What you need is a strategy to deal with this group appropriately. Your sales team is right. They should not have to speak to people who aren’t seriously considering to apply. So it’s important to establish criteria for who should receive in-person follow up and who shouldn’t. This will free up staff time and ensure quicker and higher quality follow up to people who have expressed a serious interest. “Keep me updated” forms that are very simple and prominently displayed. For best conversion, they should just ask for an e-mail address, nothing more. “Talk to me” forms which ask a couple of required qualifying questions, but promise a quick, in-person reply. This allows for the “hot leads”, who filled in the “talk to me” form, to be channeled directly to enrolment officers. What to do with the “colder” leads? There is no point of capturing people with a lower level of interest if you don’t have a plan for eventually turning them into enrolments as well. To do this at scale requires automation and a group based approach. Here are a couple of simple tactics that work well. 1. E-mail follow-up sequence: When people hear about e-mail newsletters, they often assume that the only way to do this is by creating periodic news updates and sending them to everyone. News updates are time consuming to produce and often don’t capture the imagination of prospective students. What is it like to live in [city]? Each time someone fills out the “keep me updated” form, they will receive the first e-mail in the sequence immediately, the next one a week later, another e-mail after three weeks, and so on; in increasing intervals – all of which keep your institution top of mind. Some e-mails, about the city for example, can be sent institution-wide, while others may be sent only to people who expressed interest in a specific faculty or course; thus balancing efficiency with highly relevant communication. When Open Days or other important events come up, you can e-mail the entire list to help drive attendance. One caveat: avoid boring your prospects. Prospective students don’t respond well to dry facts and claims of how great your institution is. If they want to know your ranking, they’d much rather check for themselves. Instead, share genuine stories about current students. This will help the prospective students build a picture of what it’s going to be like to study at your institution. Many CRM systems can handle scheduled marketing e-mails; but even if you don’t have a CRM, a simple solution such as MailChimp can handle scheduled follow-up sequences. 2. Retargeting: Don’t rely on e-mail alone, though. You’re guaranteed that a large percentage of people are not going to open their e-mails. In parallel to your “evergreen e-mail sequence,” you can develop an evergreen retargeting sequence that will place your stories in front of the same prospective students when they surf the web, visit Facebook or watch videos on YouTube. To save time and reinforce the message, use the same carefully developed content as a base. Publish the stories on your website and advertise them with banners. These can also be scheduled, so that in the first week after expressing interest, prospective students see one type of banner linking to the first story, and as time goes by, they get to see different banners linking to different stories about your institution. Videos bring high engagement. 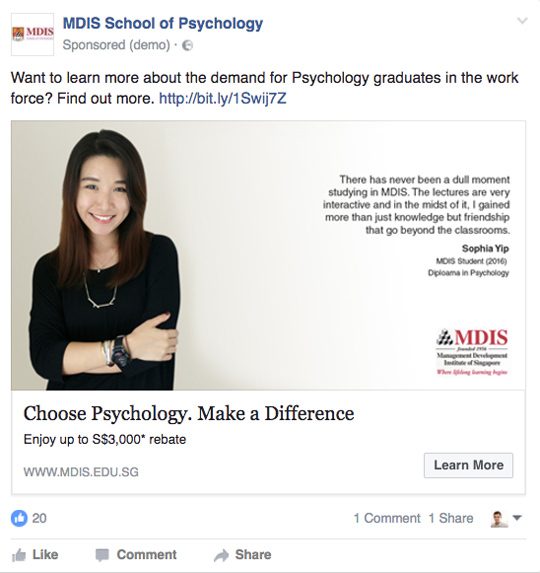 If you already have good videos about students at your institution, repurpose them as ads on Facebook and YouTube. Or develop videos in tandem with your e-mail follow-up sequence. You’ll be surprised at how little it costs to e-mail and advertise to a highly targeted group of people who have expressed interest in your institution, and at how effective it is. Traditionally, advertising has been about pushing many impressions out to a large group of people. With this approach, you do the opposite: you push out a sequence of highly tailored messages to a small, highly targeted group of people, warming them up in the process. The real investment required to make this approach successful, is in developing compelling and highly relevant stories, images and videos. Without compelling content, you’re just going through the motions and are not likely to see very compelling results. Follow up with the second group through scheduled e-mails and retargeting campaigns, and you’ll find yourself nurturing the people in the second group to be your future students. For additional background and best practices, please see “The enrolment funnel: Better results start with the prospects you already have“. This entry was posted in Marketing and tagged student mobility, online marketing, digital marketing trends, vocational schools abroad, mobile marketing.